Most toolchains for embedded system include support for random number generation. But if you’ve read the manual you’ll know that this is really just pseudo random number generation (PRNG). When calling this function the same numbers will always return in the same order unless a different random number seed is supplied in advance. [Gardner] put together a simple and cheap solution for deriving better random number seeds. 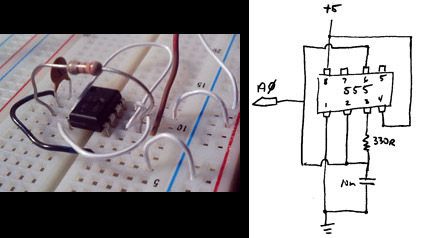 He reads a voltage from a 555 timer using the ADC on the microcontroller. At first glance it may not seem like a great source of randomness, but he performed some testing and the results look quite promising. The project is aimed at Arduino-based circuits, but any chip with an ADC will work. The 555 timer is used as a free running oscillator. We know that this not be very stable when compared to even the worst of crystal oscillators, but that’s what makes it work so well as a random seed source. Add to this the low parts count and small size of the additional circuitry and you’ve got a winning combination. So keep this in mind when you need a random number but don’t necessarily need rock solid entropy. A Brewster Angle Microscope (BAM) can run you around $100,000. If you don’t have that lying around you could just use some LEGO pieces to build your own. Having been faced with no budget to buy the hardware, and needing the data to finish his PhD, [Matthew] figured out a way to build something passable on the cheap. These microscopes bounce a light source off of a pool of water and into the lens of a camera. The thing is the angle of the sender and receiver must be just perfect at 53.1 degrees. [Matthew] was able to afford a used camera, and started experimenting with some lab equipment to mount the rig. But he just couldn’t get the adjustments right. Since he had to move the mounting hardware by hand it was impossible not to over or under shoot the corrections. But then he had a eureka moment. LEGO pieces have very accurate tolerances, and you can get geared and motorized parts. He leveraged the quality of the toy into a BAM whose alignment can be tweak with great precision. It may not look like much, but you can see stearic acid floating through the microscope’s field of vision in the clip after the break. This is exactly the type of observations he needed to perform. Of course if you just need a microscope you can use a laser and a drop of water. The hardware that went into this Arduino gaming console is just fine. But the coding that produced this game called Twisted SNAKE is beyond compare. [Rodot] has programmed several games for the hardware, which uses an Arduino, 160×168 TFT screen, a 3 axis accelerometer, and two input buttons. If you’re interested, there is a forum thread in which he talks a bit more about the hardware design. But you’re not going to want to pass up either of the two videos embedded after the break. The first clip shows off a bouncing-ball platforming game. The accelerometer moves the ball back and forth, and the top scrolling level brings more ledges into play. This in itself is a great game. But the Twisted SNAKE game shown off in the second video makes our own ARM-based Snake game look like a 3-year-old programmed it. [Rodot] filled up all of the program memory of the ATmega328 chip to make this happen. There’s a menu system which allows for color themes and difficulty selection. The game play itself lets the snake travel anywhere it wishes with the tail following behind in graceful curves. Wow! Take a look at BrewPi, a fermentation controller made with a Raspberry Pi. The project hacks control of a refrigerator and a light bulb into the pervue of a Raspberry Pi board. The RPi itself brings network connectivity to the mix. What you end up with is an already highly configurable fermentation system which is perched to receive even more features moving forward. The man behind the system is [Elco Jacobs]. You may remember his name from the UberFridge project. That was a router-based fermentation controller. This keeps the same great hardware as well as online graphing and control features such as setting plot points for ramping temperature up and down. For now there’s also an Arduino being used which takes care of the hardware switching via json packets received from the RPi. But now that he’s worked out most of the bugs it should be fairly painless to dump the Arduino and build a proper RPi shield for this purpose. Building a Persistence of Vision globe is pretty awesome, but overlaying a Death Star pattern on the display takes it to the next level of geekery. Like us, [Jason] has wanted to build one of these for a long time. His success pushes us one step closer to taking the plunge and we hope it will inspire you to give it a shot too. As he mentions in the beginning of his write up, the mechanical bits of these displays are really where the problems lie. Specifically, you need to find a way to transfer power to the spinning display. In this case use went with some DC motor brushes. These are replacement parts through which he drilled a hole to accept the metal axles on top and bottom. We hadn’t seen this technique before, but since motor brush replacements are easy to find and only cost a few bucks we’d say it’s a great idea. The 24 blue LEDs that make up the display are all on one side of the PCB. They’re driven by an ATmega328 running the Arduino bootloader. [Jason] uses an FTDI adapter to program the chip. Don’t miss the video embedded after the break.